Gouty arthritis is a metabolic disease marked by urate crystal deposits in the joints throughout the body, causing local irritation and inflammatory responses. Gout is characterized by formation of tophus deposits in soft tissues and urate crystals in joint synovia. 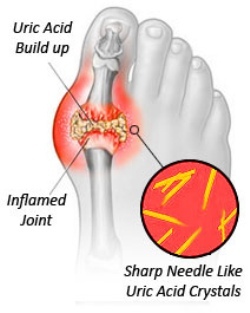 It primarily affects joints in the feet (especially the great toe) and legs, but it may strike in any joint. The disorder follows a variable course of periodic attacks, often with long symptom-free periods between attacks. Eventually, it can lead to chronic disability and in some cases, severe hypertension and progressive renal failure. Sudden attacks, usually at night, with periodic remissions and exacerbations. Hyperuricemia, tophi, joint destruction and renal problems are treated after the acute inflammatory process has subsided. Urge the client to drink 2 to 3 L of fluid daily and to report any decrease in urine output. Teach the client about dietary modifications to limit foods high in purine (e.g. organ meats, anchovies, sardines, shellfish, chocolate, meat extracts). Provide measure to promote comfort and reduce pain. Maintain strict bed rest for 24 hours after an attack. Provide a bed cradle to keep bed linen off affected joints to help reduce pain. Administer prescribed medications, which may include nonsteroidal anti-inflammatory drugs, uric acid synthesis inhibitors, and uricosuric agents. Colchicine may be prescribed for acute attack and used in small doses for prevention. Nausea, vomiting, and diarrhea are toxic effects of colchicines and should be reported to the health care provider.